Attractive indoor climate and modern infotainment options for drivers and passengers are what meet widespread demand for custom, modern mobility in public transportation. eBus-Cluster creates a harmony between every demand and proves that comfort too can contribute to the safety and performance of every vehicle. 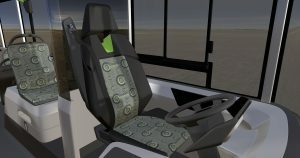 Also, for the field of comfort, eBus-Cluster has brought well-known partners on board: Kieback-Schäfer Group with its subsidiary DMS, Franz Kiel GmbH and Farhym. The Kieback-Schäfer-Group, abbreviated KSG, combines three modern traditional companies: DMS, Schäfer and Kieback. With a broad service portfolio of the highest quality, KSG achieves perfection as a valued turnkey provider in automotive engineering. KSG spans the complete process-chain from design through to production of both prototypical and serial parts. An appealing, modern design of each vehicle is an essential factor. Here, Kieback-Schäfer-Group with its experience is a reliable partner in eBus-Cluster. One innovative component for eBus is the new Kieback rear flap, designed with a lightweight construction. Within the project, DMS developed concepts and design proposals for interior and exterior design of the vehicle, realized their structure in CAD and 3D models, and assisted fellow Cluster partners in realization of implementing their systems. In addition, DMS delivered solutions for visual process adjustment in Virtual Reality, or abbreviated VR-System. 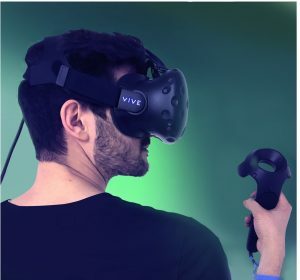 High-performance computers reach an extremely high visual fidelity, so the virtual world can be shown and viewed as close to reality as possible. Selectable functions and features enable viewers to see and experience the entire design and all its models in real-time. Furthermore, temperature-adjustable ambient lighting creates not only a pleasant atmosphere, but also guides passenger pathways throughout the climate zones. 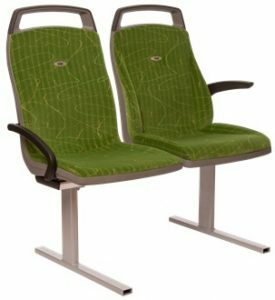 KIEL is leading manufacturer of seating systems for commercial vehicles and public transportation in local, regional and tourist traffic. To contribute to the eBus-Cluster, KIEL equips its state-of-the-art seating system CITOS with USB-charging sockets as well as sensors for acquisition of occupancy data and controllable seat heating. This same data is then delivered to the IoT. Thanks to its durable plastic construction, the lightweight design of the CITOS reduces the overall vehicle weight and thereby saves power. Recording and evaluation of actual passenger distribution or occupancy by all the systems integrated by the partners is additionally supported by installed modern interior cameras of Hella Aglaia. Farhym is a global system supplier for leading commercial vehicle manufacturers, headquartered at two sites in Turkey. Vertically-integrated, Farhym covers all processes from product design and development through to production. As a subsidiary of the German firm Hymer Leichtmetallbau GmbH & Co. KG in Wangen, the interior decors of vehicles, especially coaches and public buses, are realized — featuring air ducts, luggage rack systems, interior lighting and lining as well as further interior components. Fahrhym integrates the sidewall heating from CELLOFOAM in a new concept for both sidewall and roof lining. This not only records passenger flows, but also controls the psychology of the bus by establishing different separated zones with various lighting levels and uses of the air-conditioning system. Air outlets for acclimatization are evenly distributed throughout the vehicle and controlled in that manner, giving passengers the ultimate experience. Supported by integrated RGB-lighting, the passengers are guided to the areas with the best actual temperature. The system itself is realized with new cross-cut flaps, with an ergonomic and maintenance-friendly design. 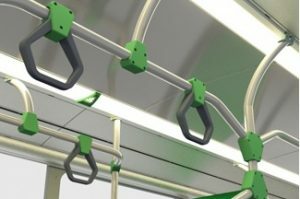 In addition, thanks to outstanding haptics combined with integrated stop-call and emergency buttons, the Farhym Stanchion System made of aluminum profiles to their optimal weight, and plastic knots, contribute to not only passengers’ comfort, but also their safety. Nonetheless, only the interaction of all single system data recorded and transmitted to Internet of Things, the processing as well as the feed-back to the single systems enables an optimum adjustment of interior temperature to the actual needs of the passengers. This means both: an high passengers comfort at reduces energy need and enhance efficiency. Would you like to experience more of the eBus-Cluster? Do you have questions regarding the Project? If so, please use the form below to send us a message. Your message will then be passed along to our Project Partner.